Hot Tub Covers w/ FREE Shipping ~ Made in the USA! Order factory direct and save! button below to search our manufacturer databse. If you know your size, click “build my cover” to get started! Every hot tub cover is made to order, right here in our Florida factory by a team with 20+ years of experience. Take pride in knowing you’re supporting local/national business! We do our best to ensure that every cover is made to fit perfectly. We follow up with every order to verify dimensions and make sure you get exactly what you need. Buying a new spa cover online is not easy, and we do our best to keep customers informed and help out during the buying process. That’s why we provide live chat support and customer service via our toll-free number. I was so pleased with this company, that I referred the company to my mother-in-law as well and she ordered her cover from them too. Now, one must always stay in good standing with the “in-laws” so you must know that if I referred the hot tub covers to her, they MUST be a good company, right? My (and her) covers were well-made, beautiful, we had great color choices, size and shape choices. We received confirmation and update emails throughout the process. When the time comes for a new cover, I will definitely use Hot Tub Cover Depot again! At Hot Tub Cover Depot, we bring years of experience in manufacturing durable, long-lasting covers that meet our customer’s needs. Below you can find some of the main features that come standard with any spa cover. The liner is a key component of your cover because it’s exposed to the steamy water much more than the vinyl top. Some manufacturers use a solid liner, which collects much more condensation. 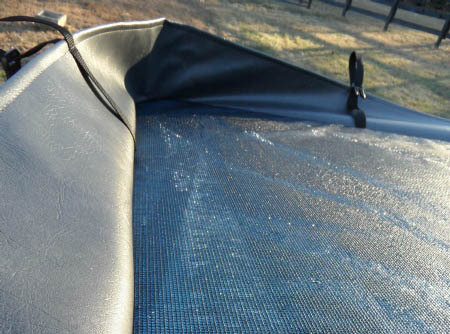 With a mesh underliner, the same processes of condensation occur, but only a single drop of water must collect before it can drip back down to the water. Much less bacteria will grow, and your cover will last much longer from less water collecting on the surface of your hot tub cover. You don’t think much about handles until they tear off and aren’t there as you struggle to lift your cover. 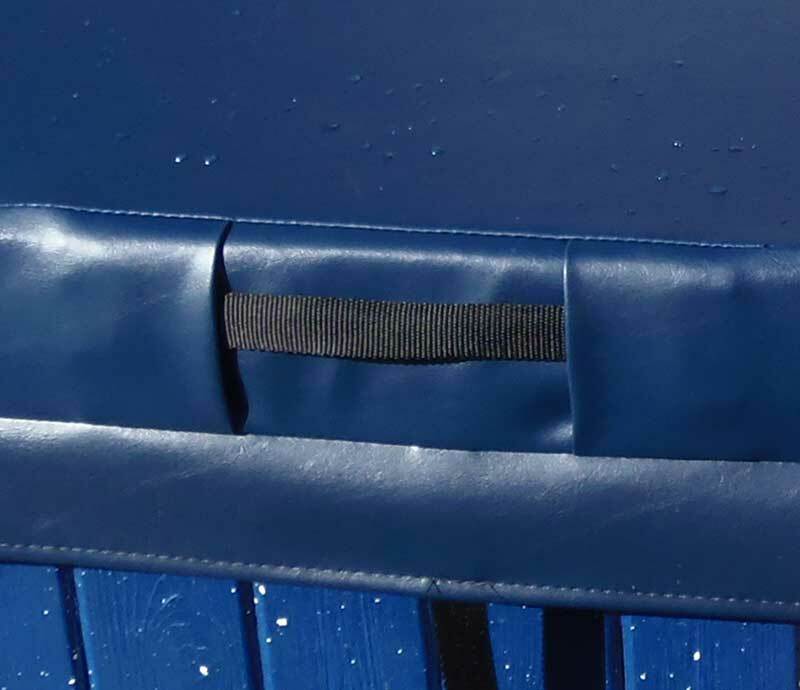 Our covers come with four handles that are triple stitched for extra reinforcement, and fit flush into the side of your cover for a clean appearance. The vinyl exterior is key for keeping your cover protected from the elements. We use a 26 oz. 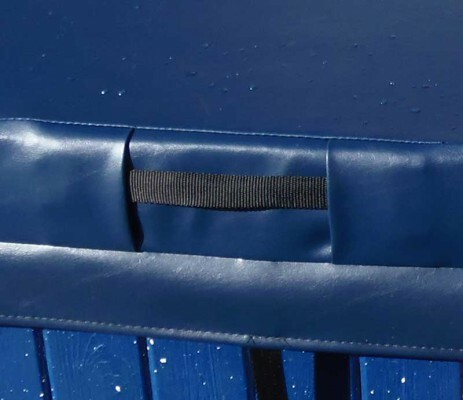 Marine Grade (best for UV) vinyl that is resilient, mold-resistant, and thick enough to prevent cracking and splitting. 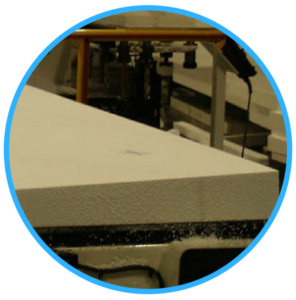 Each cover is treated with a chlorine protective spray before shipping to make sure it arrives with maximum protection power. Replace your worn out spa cover today. Starting at $294.99.